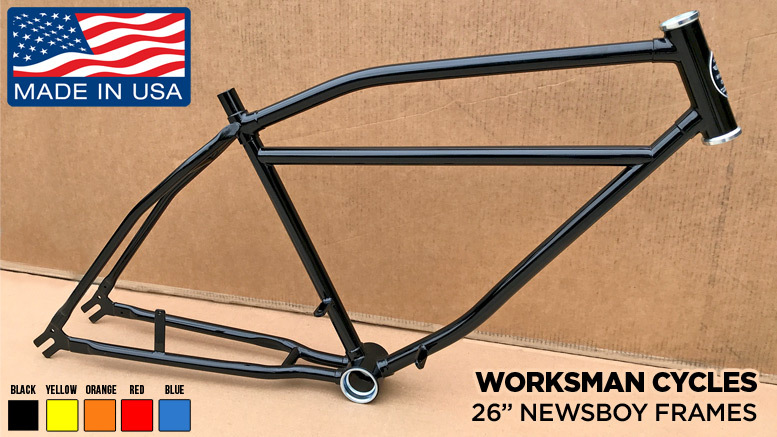 Rat Rod Bikes is proud to offer steel Worksman Cycles Newsboy 26″ Cruiser Bike frames and forks in our online store! These industrial grade frames and forks are made in the U.S.A. Worksman Cycles has been in business since 1898 and are known for building top quality bicycles that are tough as nails. The frames are available in 5 different colors including black, yellow, orange, red and electric blue. The black, yellow and orange frames are priced at $189.50 and the red and electric blue are $214.50. The frames come with bearing cups installed as pictured. The Worksman forks come in black only and have a price of $49.00. We are also offering the correct YST headset for $13.00. The classic style of the Newsboy frame make it the perfect base for your custom cruiser project. They provide a very comfortable ride suitable for most riders. This could be the start of the next wave of custom cruisers! Make American bikes great again!